Say sayonara scented candle! It’s time to think outside the gift box and give the unique gift of art this festive season! Here at the gallery we all too often see visitors who want to give the gift of art for their loved ones, but get themselves into a state of exasperation trying to decide which artwork would be right. 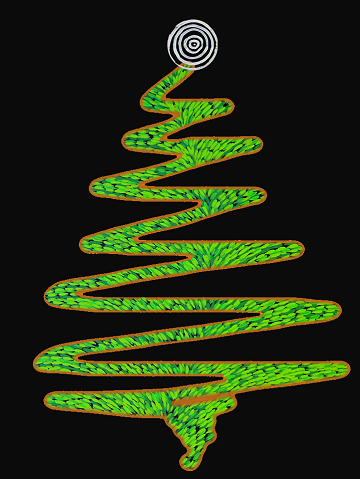 So, to help you out this festive season, we’ve created a ‘gift guide’ where we’ve listed some fabulous Aboriginal artists, and the personality types we see going gaga for their work. Of course this is just a suggestion; nobody knows your friends and family better than you do, so be brave and confident in your decisions! And don’t forget – here at Kate Owen Gallery we are very understanding if an artwork was purchased as a gift and may not be quite right. Our Art Consultants are always here to help so please don’t hesitate to contact us. Ready to start your Xmas shopping? Let’s go! If they would respond with something along the lines of A) then it is best to go for an aritist that has precise dot work or a systematic composition. Artists that instantly come to mind are Walala and Thomas Tjapaltjarri. These are highly regarded artists that we featured this year in our ‘Three Brothers’ exhibition. Geometric shapes and a carefully applied dot work give these artworks a powerful ‘Shimmering’ quality synonymous with depictions of the Tingari Cycle. These artworks are a great ‘go-to’ if you are purchasing for a man, as these artworks depict secret sacred men’s business, so there’s a great connection and story to share as you gift the artwork. Two other trailblazing artists who are soaring to dizzying heights are the King Sisters. Back in 2009, Kate Owen Gallery was proud to present the 3 Kings exhibition, where Sarrita and Tarisse King paid homage to their father, the highly respected artist and elder, William King Jungala (1966 – 2007). Back then, the sisters wove their own styles with that of their father and produced fascinating interplays of colour, design, heritage and spirit. While still at the early stages of their careers, we could tell that Sarrita and Tarisse were set to become big names in the Aboriginal Art world. Flash forward nine years, and the King Sisters have cemented themselves as the exciting next generation of Aboriginal artists. 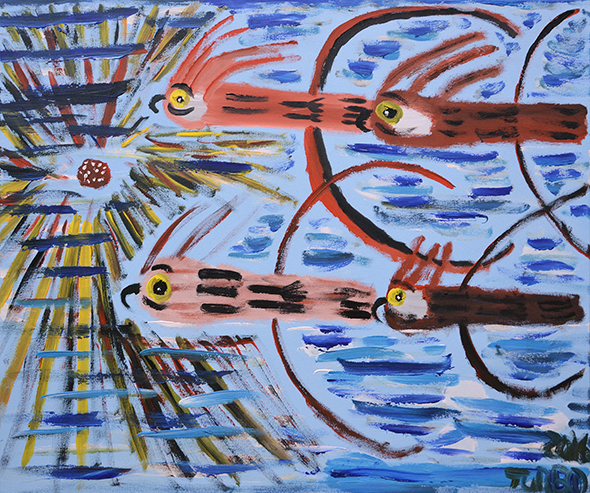 Still honouring their father’s stories, the sisters have matured and developed their own unique style which has seen them displayed in galleries throughout Australia and around the world. Their works are vibrant, striking and contemporary. The sisters employ a diversity of styles and colour palettes which make them perfect artists to explore as gift options. Whilst these “giftees” will simply not appreciate the loose, wild, and gestural nature of a Polly Ngale Bush Plum or a Gloria Petyarre Bush Medicine piece, but a good alternative is a Jeannie Petyarre Bush Medicine piece. It may come as a surprise, but we find the focal point in Jeannie’s art makes all the difference for these logical folks – it provides an opportunity to enter the artwork and be taken on a journey through the flowing bush work. We would also recommend heading to our Art Search Page. On the bar to the left try searching for ‘Style: Dots – Fine’ or ‘Style: Dots – Medium’ as we do find these types of art lovers appreciate the time and effort to create such a piece. Have you heard your friend ever mention that they love Monet’s water lilies? Or do you notice they lean towards more organic shapes? Then we’d recommend exploring the beautiful bush plum and bush medicine leaf paintings made famous by the artists of Utopia. These artworks are produced using acrylic paints loaded onto a single brush and then applied or ‘pushed’ vigorously into the canvas, linen or board in such a way that the paint is mixed in the resultant mark on the canvas. These artworks may appear more abstract, but they are deeply grounded in Awelye. Another artist who depicts Awelye is Charmaine Pwerle. Charmaine’s lines are bold and sure, echoing those of her grandmother Minnie Pwerle, but with the assurance of a much more practised artist than her years or experience would suggest. The brushwork in her body designs, Awelye, has all the characteristics of this family dreaming, but Charmaine lends her own distinct creative flair, pattern and movement to the canvas. We held an exhibition earlier this year showcasing her incredible talent titled Charmaine Pwerle – New Traditions. I have to look inwards to describe this personality – as I absolutely LOVE this style of art ! I think it’s fair to say we are a quirky bunch – if you were drawn to Courtney’s styling on the recent TV series of Channel Nine’s The Block (the more lamas the better!) then I think it’s safe to say this is your squad. Perhaps you’ve admired the Tjanpi Desert weavers or the soft sculptures of Yarrenyty Arltere Artists? To you – figurative art that’s a little off beat is fine, because it’s bursting with personality. There may be simplicity of form in Karen Napaltjarri Barns and Trevor ‘Turbo’ Brown's art, but there is an incredible energy in the dynamic composition, colour and line. 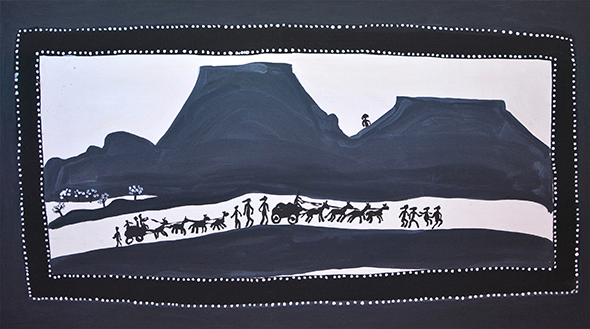 What makes naïve Indigenous Australia art so fascinating is that certain artists, such as Linda Syddick and Jack Dale, have used this style to depict the changes in Aboriginal life, their interface with the 'whitefella' ways, and their experience through this period of seismic change. If you have an interest in history, these artworks represent a fascinating first-hand account of important moments in our nation’s history. When it comes to this artist, it’s quite clear – you either love his work, or you don’t. And that’s fine. All we say is – we’ve had visitors to our gallery who never considered his work and left the gallery converted. What amazes us about Kudditji Kngwarreye’s artworks is that we never tire of them, as they are always revealing themselves. The light at different times of the day emphasise certain colours in his work which is just magical. Each artwork also has quite a unique ‘feel’ and can completely change the atmosphere of a room. Take for example the images below. It’s the same space, the artworks are the same size, but the artwork selection has completely changed the feel of the room. 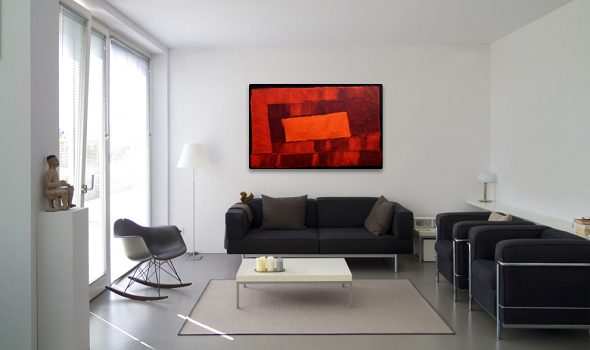 This artwork brings a beautiful warmth to the room and is very grounding. Whereas this artwork is very uplifting and keep as cooler tone to the room. Both look fabulous, but it is really a personal preference what mood you want your home to have. When it comes to giving the gift of a Kudditji, make sure you have a clear understanding of your loved ones home décor, so you can select the right piece that will match the mood. 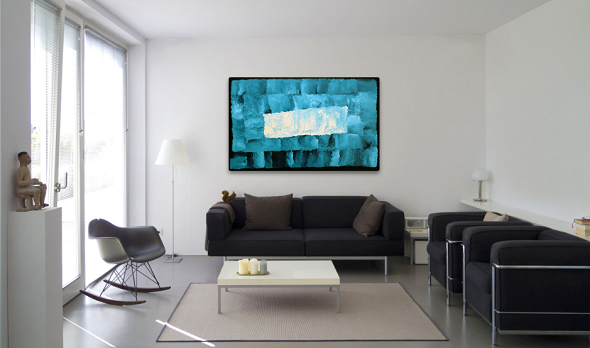 Check Out our 'See Art on Wall' feature! Why not give them a piece of Australia to take home with them? We find that most international clients love a conversation piece – something that they can proudly hang on their wall and share their stories of their time in Australia, and impart some interesting information about the world’s oldest living culture. Kathleen Buzzacot and Selma Coulthard are brilliant choices. Their work depicts the features of the land and the native fauna in incredible detail. Peter Overs is also a popular choice due to its universal appeal and neutral colour palette. The artists of Yuendumu are also an excellent choice as they come with a certificate of authenticity from Warlukurlangu Art Centre which explains the artwork story in great detail. 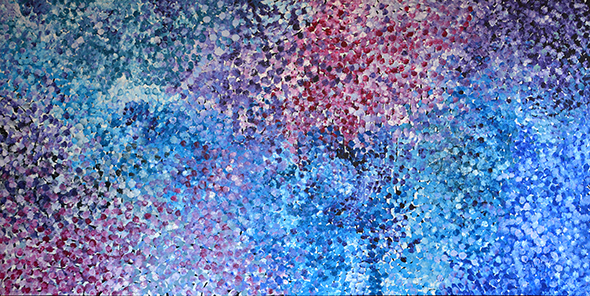 Head over to our Art Search Page and in region select ‘Yuendumu’ – you will be spoilt for choice! If your international family and friends have to catch a plane home, you may have to consider size as well – we have a huge range of artworks that can safely be rolled in a tube and taken as hand luggage. If all of this information has just made you even more confused – well, why not give your loved ones a gift voucher, or create a gift registry page where multiple people can make a contribution. Then your loved ones can use all of our gallery services to help pick the perfect piece for their home. As we mentioned at the beginning of this blog post – these are all just our suggestions and nobody knows your friends and family better than you do, so be brave. Your loved ones will probably be very touched you thought of such a unique gift for them that truly will last the test of time.